Although the majority of monkeys live in tropical rain forests, some have adapted to live in the open land of the savannas. The patas monkey, the vervet monkey and some species of baboon all live primarily in open brush, and each has evolved to their unconventional primate habitat in different ways. The patas monkey is a medium-size monkey, growing to 33 inches in adulthood, with a tail nearly as long as its body. One of the ways the patas monkey has adapted to living in the savanna it in its running ability; the patas monkey is the fastest running primate, and can reach speeds of 55 miles per hour. This speed allows the monkey to escape predators more easily. The patas monkey also has a rapid reproductive cycle, another adaptation that helps the species to flourish despite vulnerability to predators on the savanna. The vervet monkey thrives on the savanna on a primarily vegetarian diet; it consists of seeds, wild vegetation and savanna insects such as grubs and grasshoppers. Vervets have adapted to open-savanna living by organizing themselves into complex groupings for safety, sometimes called "troops." One alpha male leads the troop, and males born into the group eventually leave a troop to move to another. Vervets are often studied for their social interactions among one another, as they closely resemble the social interactions of humans. Vervet monkeys are among the few animals in the planet who have shown a capability for spiteful action. 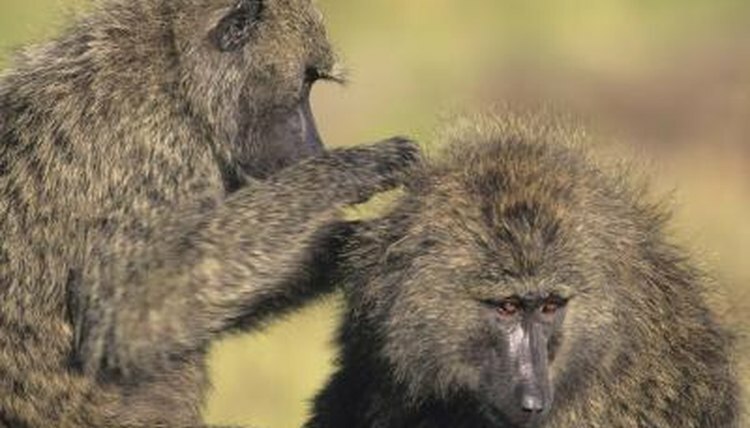 Baboons, some of the largest monkeys in the world, also form complex troops of up to hundreds of baboons. Four species live on the savannas. These four species -- the Guinea, chacma, olive and yellow baboons -- are often referred to as a singular species, "the savanna baboon," by some biologists. These creatures, who share 91 percent DNA similarities with humans, have adapted to savanna life by becoming strong; male baboons are more aggressive and more powerful than their ancestors. Baboons also survive on the savanna as opportunistic eaters; they consume insects, plants, nuts, seeds and meat, often the young of animal groups they come across. The green monkey is not technically a savanna monkey, as its main habitat is the forest edges that border wide open savanna spaces. During the day, however, the green monkey spends much of its time crossing the savannas and foraging. On a diet of savanna leaves and grasses as well as fruit, nuts and seeds, the green monkey collects food in its mouth and stores it in cheek pouches. Upon its return to forest's edge, the green monkey eats in relative safety. Demography and Life Histories of Sympatric Patas Monkeys, Erythrocebus patas, and Vervets, Cercopithecus aethiops, in Laikipia, Kenya; Lynne Isbell et al.